The case and 4 rolls of outdated 35mm film are included. make Supersized seem small. VINTAGE SPARTUS PRESS FLASH CAMERA WITH CASE AND COVER. Shipped with USPS Priority Mail. "Spartus Six Twenty Flash ", "Untested". "One Unopened Roll of Film". We do our best to give you 5-Star service. -We can also help you choose an appropriate item for your need. This is my way of recycling. Made in USA. A must have for the serious collector. 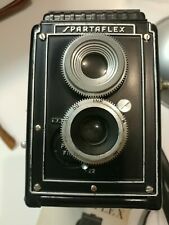 Vintage SPARTAFLEX Spartus Box Camera Made in USA 100mm F7.7 - F22 Comes with original manual and flash bulb. Not sure if working. For collector's collection. Shipped with USPS Priority Mail. VERY NICE PRESS FLASH IN GOOD PLUS CONDITION WITH WORKING SHUTTER. NICE ADDITION FOR YOUR COLLECTION. Untested since I have no film. VERY NICE SPARTUS SIX TWENTY IN GOOD PLUS CONDITION WITH WORKING SHUTTER. It is SUPER clean, there is no internal or external wear. • The shutter blades are clean. In good working order. Approx 5in x 4.5in x 3in. Also included is Instruction pamphlet. Graphics are visible. Pamphlet has smudges, creases and small tears. The lenses have fungus in them. The shutter works well. The viewfinder works great and is fairly clean/clear. Original Case. Film take up spool included. I do not know if it works. I am not an expert, I do my best to research each item to the best of my ability. HEROLD SPARTUS 35, IN DECENT BOX, WORKING, LOOKS EX/EX . We want you to be happy. You are responsible for them, and we do not know how much they will be. This is an unused Vanguard Spartus camera including all orignal items that came with it. The Vintage 1960's Vanguard Spartus Box Camera w/Flash Unit is in the Original Box and is in original condition. Vitage, SPARTUS FULL-VUE, Spartus Camera Corp. Chicago, Ill., made in USA. nice. Chicago, Ill., made in USA, condition looks great. Box is dirty and has 2 seperated corners on the lid. bottom part of box is intact. Also has original directions pamphlet. Takes 127 film, which I do not have, thus it is untested. Antique spartus full Vue camera made in Chicago Illinois made with Bakelite. Fine Art Photography Spartus Full-Vue Vintage Camera. Camera is in good condition I'm not sure if you can really take pictures with it or not. I am selling as is for parts or display, or camera collector. SPARTUS 35 F MODEL 400. Flash:Dedicated Spartus bulb flash unit, fits to the two holes on the the top plate. Winding knob: on the top plate, double exposure prevention. Shutter: Simple spring rotary shutter, one speed, Instant (1/50) T (B), setting lever on the shutter. VINTAGE 1950s SPARTUS FULL-VUE 120 TWIN LENS REFLEX CAMERA & FLASH W BOX & INST. Vintage Spartus “35 R” camera model 400 with leather case. Item is in used condition and is untested. This item was used by a family member and there is no reason to suspect camera doesn’t work. Thank you for viewing! SHUTTER WORKS. NICE ADDITION FOR YOUR COLLECTION.